I live in New England and it is where I always wanted to live. I think I originally had a more northern destination in mind, but the requirements of work brought us originally to the Boston area and eventually, out to this valley. 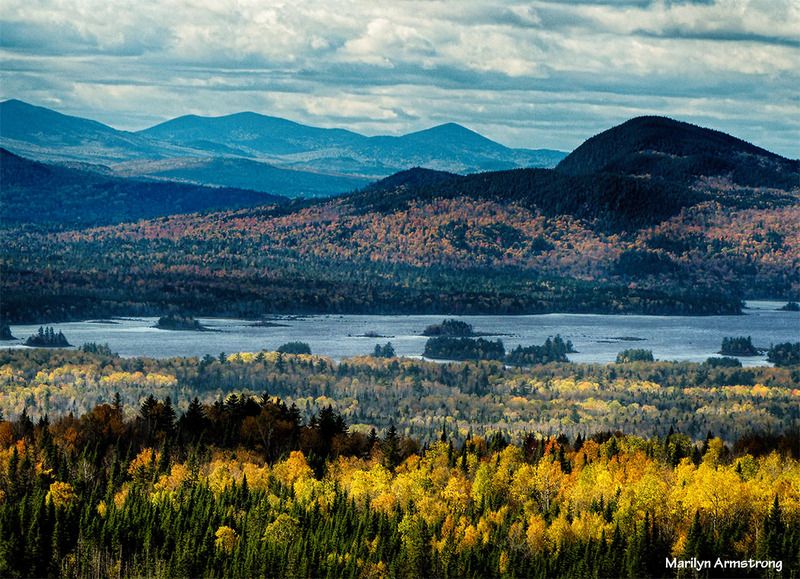 When I dream of the glory of a New England autumn, I dream of Vermont, northern New Hampshire, and Maine. It is beautiful here, too, but up there … it’s breathtaking. I’m sure the leaves are already changing there. 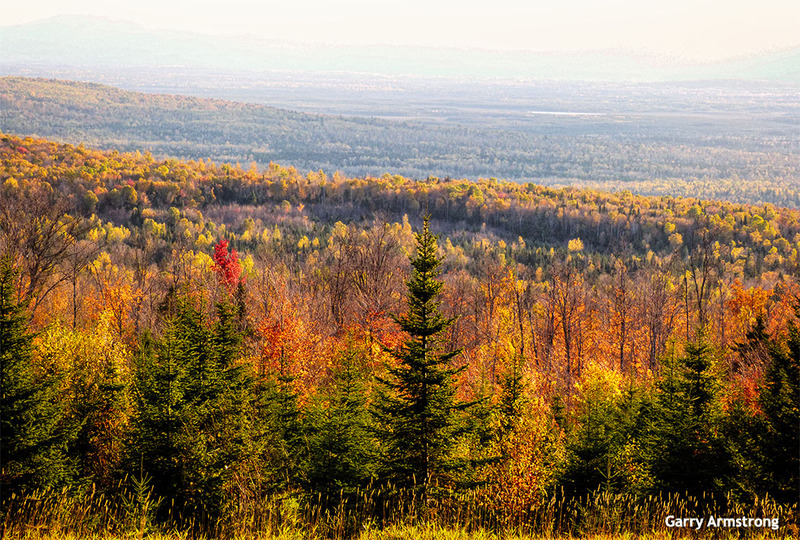 Up by Jackman, Maine, the weather is changing now and the leaves are turning. Someone asked me about the place and I dug up some information. 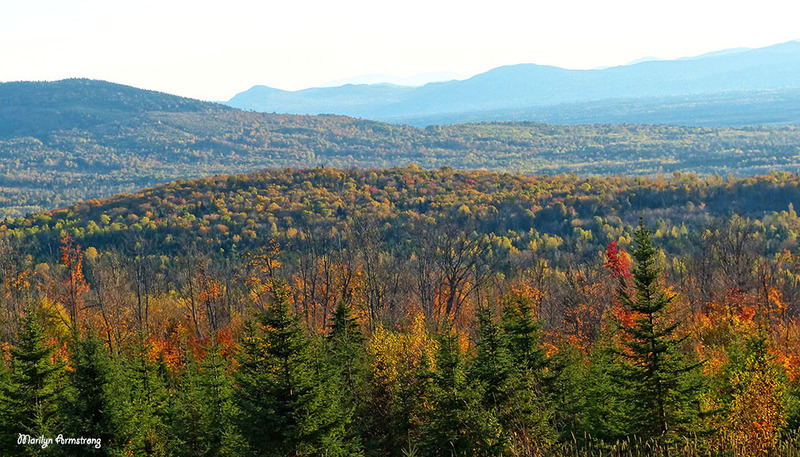 This is one of the most undeveloped areas in New England. It is poor and while there are some “resorts” there, it never developed the other places have. Partly, it’s because it is so far from anything else. Jackman is a tiny town. Not much work. A bit down on its luck. Any number of attempts have been made to make the place more desirable to tourists, but except for anglers, it’s just incredibly beautiful. And relatively inexpensive, if you don’t mind driving many hours up into the mountains. It doesn’t hurt to have a pretty sturdy little car with four-wheel drive, either. And some good camera equipment. 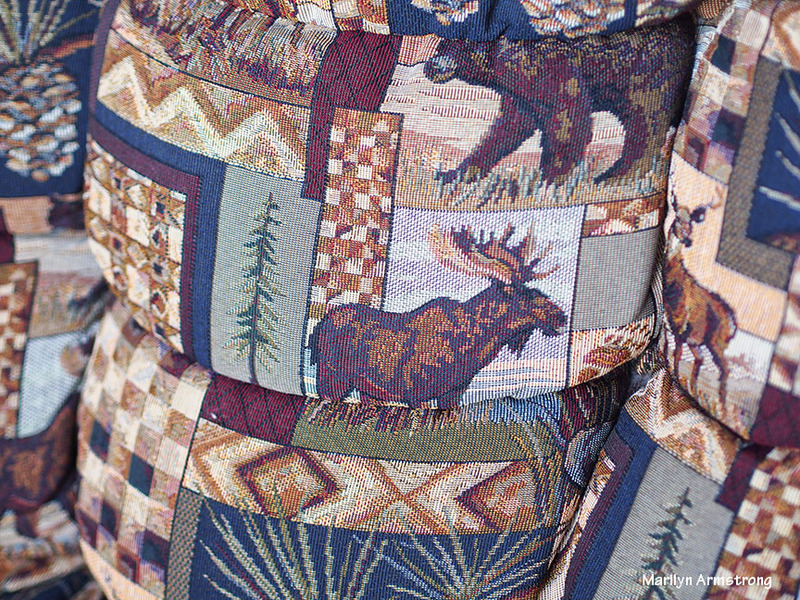 There are bear and moose are everywhere. There are a lot of signs along the road warning you to be very careful. Moose plus car in a collision will probably kill the moose AND all the people in the car. They are really huge animals and this is one of the places they like. Moose like bitterly cold temperatures. Any time it gets much above freezing, as far as the moose are concerned, it is too warm. The colder it is, the happier they are. Attean Pond is one of four large bodies of water in the Moose River drainage to the west of Jackman. More than 40 islands are found in the pond. With 1 exception of a set of commercial C:1mps on some of these islands, the area remains undeveloped. 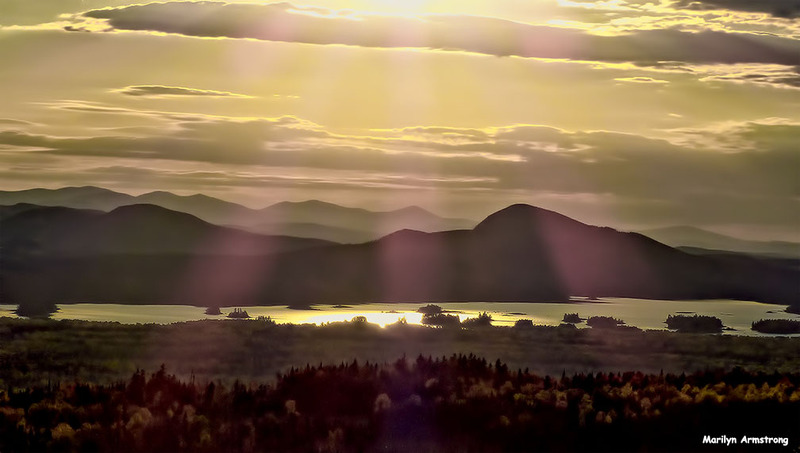 Sally Mountain to the north, Attean Mountain to the west, and rolling hills to the east and southeast complete a scenic background to the pond environment. The shoreline of Attean Pond varies greatly in composition, providing a diversity of habitat types. Some areas consist of rock and ledge, others are gravelly, some weedy. Among these, several fine sandy beaches are available. There are a number of good campsites around the pond, which are often utilized by people making the popular Moose River “Bow Trip.” Attean Pond is the beginning and end of this 30-mile canoe trip. A one-mile carry trail connects the western end of Attean with Boleb (?) Ponds, which then provides access to the Moose River and the opportunity to return to Attean. Wild populations of brook trout and salmon are present in Attean Pond. However, large areas of shallow water are marginal habitat for these cold water game fish during the summer months. Of the total area, only about 600 acres have water deeper than 20 feet. In addition, large populations of yellow perch, suckers, and minnows compete for the available food supply. This further limits the potential for brook trout production. Maine and other small brooks that flow directly into the pond offer few areas that are suitable for spawning. or that could recall large numbers of small salmon or trout. Lake trout are occasionally caught in Attean Pond. These have moved upstream from Big Wood Pond, where they are stocked. and dwell in a small area of deep water al the western end of the pond. Because of the competition from non-game species, especially yellow perch, brook trout management through stocking is now impractical. Under existing conditions, wild trout should continue to provide a small fishery. Lake trout can utilize the non-game fish as forage, but it is unlikely that a sizeable lake trout population could be maintained. Management for this species is precluded by the small amount of deep, cold, well-oxygenated water available in the western end of the pond. Thus, at present, Attean Pond is best suited for salmon. A smelt population provides the forage necessary to sustain this species and salmon are perhaps more inclined than brook trout to travel long distances up the Moose River to the 10 spawning areas in its tributaries. Small numbers of marked hatchery salmon will be stocked to supplement the wild population. Their growth and contribution to sport fishing will be followed via information from anglers. This is a fabulous place for a photo vacation. 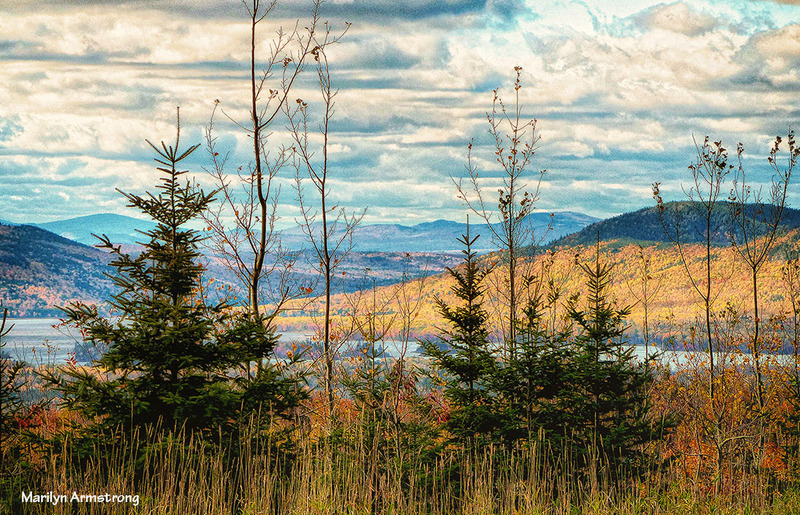 Rough and undeveloped land — with plenty of wildlife and an autumn to die for. I wish we were going, but it’s too much driving for us these days. 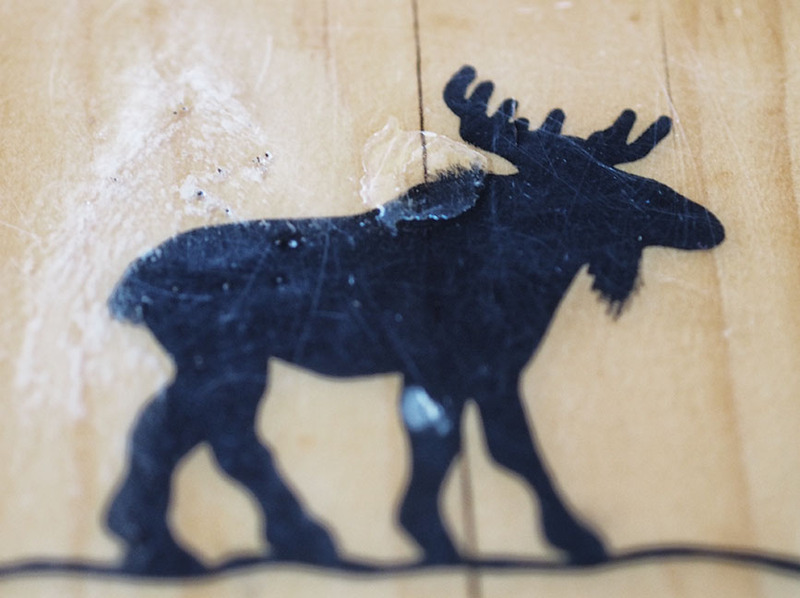 Up here in the mountains, near the Canadian border, it’s all about the moose. But not just living, breathing, furry moose. Everything is moosey. 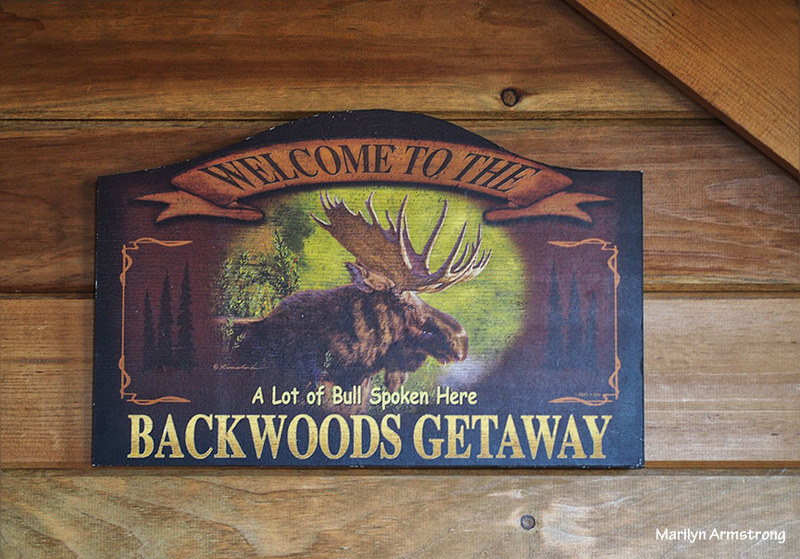 This cabin, from the kitchen counter, to the base of the coffee table, to the lamps, upholstery, wall decorations, and trim on the bathroom walls … it’s all about moose. 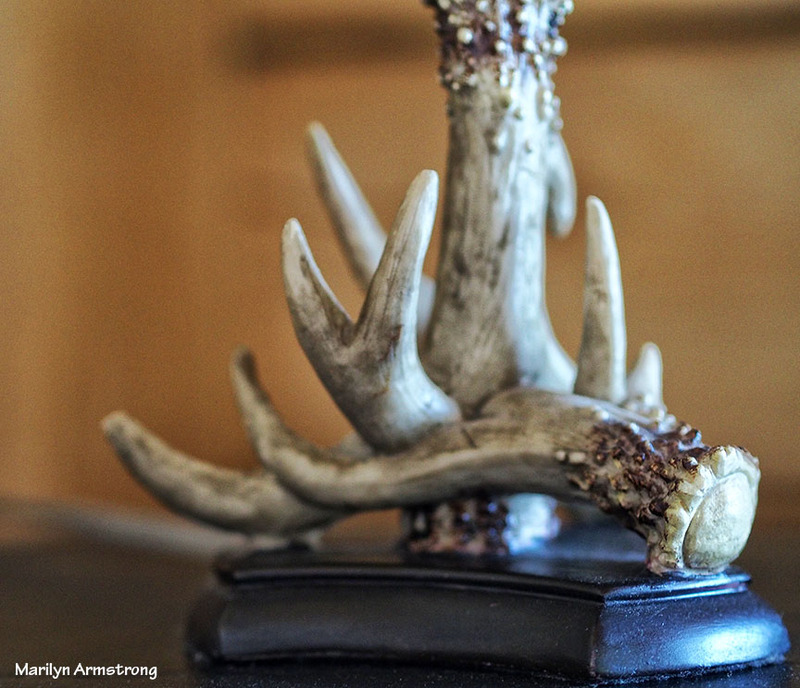 This is actual moose antler. It is a lamp base, one of several moose-themed lamps in the cabin. And please, let’s not forget the upholstery! 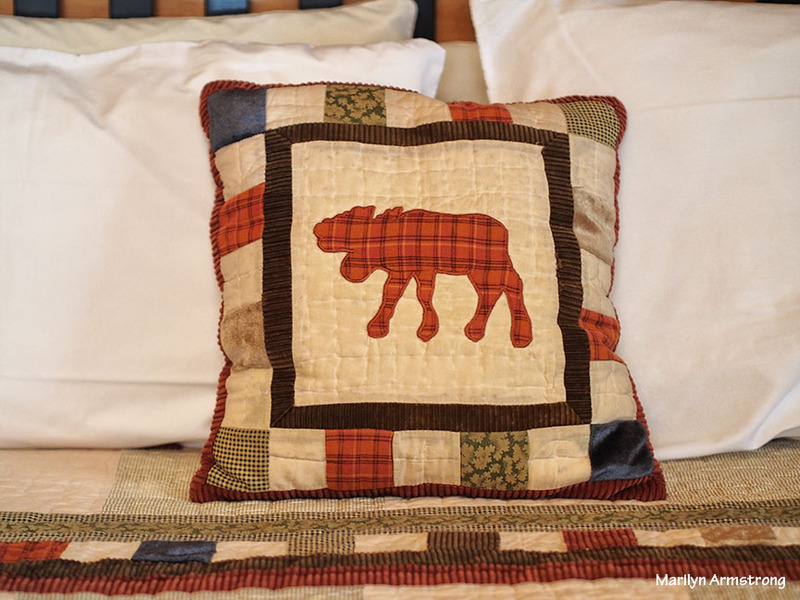 In the bedrooms, the quilts feature moose, bear, deer, and geese. With coordinating moose throw pillows. The dishes show pictures of moose. There is moose wallpaper and trim in the bathroom. 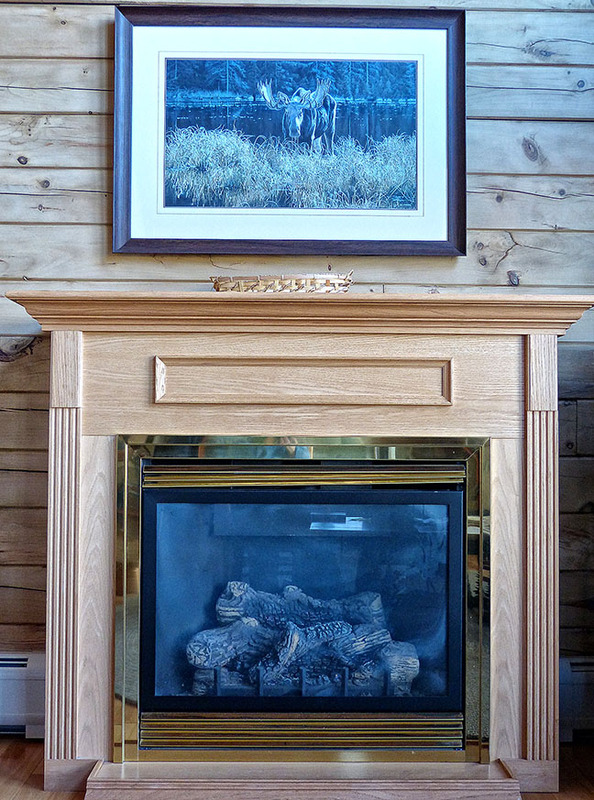 I will save the moose coffee table and matching lamp, as well as the actual portrait of a bull moose over the fireplace, for a separate post. Suffice to say, they are serious about moose in this neck of the woods. READY – ON YOUR MARK – GET SET … VACATION! Well I’ll be darned if this isn’t downright appropriate. Today is the day before an important event. Yes indeed, tomorrow Marilyn and Garry pack everything — or nearly everything — we own, into the car. 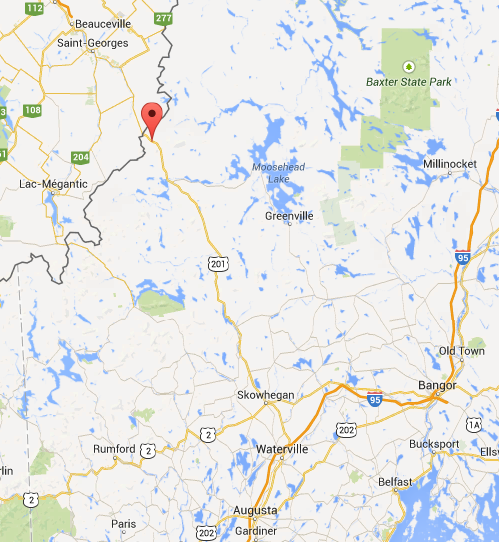 Then drive north, north, north, north until we finally finish our journey in Jackman, Maine. Jackman is marked by the red thingy. Even though it doesn’t say Jackman. You’ll have to take my word for it. If Jackman isn’t moose central, than I don’t know what is. Last time we were there (three years ago) it was May. Not a particularly good time to see moose because they have babies with them and the weather is warming up. They aren’t especially frisky in warm weather. Moose like it cold. They aren’t comfortable until the thermometer dips into the 20s. That would be Fahrenheit. For you who live by Celsius (the world), that’s minus 7 and lower. In other words, cold. 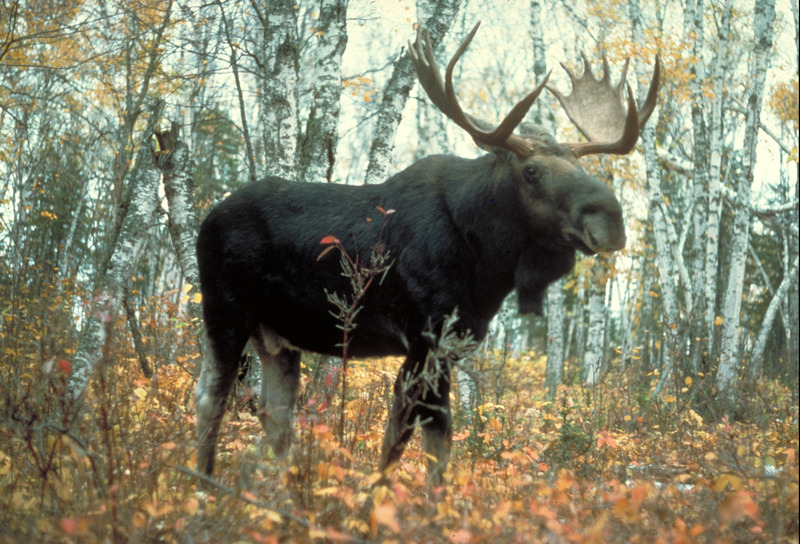 Moose have thick hides and a goodly amount of fur. They are happiest while humans are bundled up, sitting by a fire with hot cocoa, complaining about the weather and dreaming of spring. That’s when out huge hoofed and antlered pals finally stop wishing someone would turn on the air-conditioning. Mind you, they lose a lot of weight in the winter because there’s not much to eat, but they chow down like there’s no tomorrow all through the spring, summer, and fall just so they’ll have fat to burn when the snow comes. October is a special month for them. November too. Their hormones rage. Moose are horny (sorry about the pun). It’s rutting time in the great north land. Horny moose are irritable, frustrated, and moody. Especially guy moose. All they want is a big furry lady moose to snuggle up to, make a few baby moose. Instead, they have to compete with other bulls who have the same idea. Then, there are annoying people like me and my camera. Who are those aggravating naked weasels flashing lights at them? This is why, although I want very much to get some fantastic pictures of the big guys, I have to admit that I might not. Moose are nocturnal. Not much into sunshine (too warm and bright, thank you very much). They come out mostly after sunset, which makes taking their picture more difficult … unless you use a big strobe. But big strobes are annoying under the best of circumstances. Not to mention I don’t actually own a big strobe, not since I gave up wedding photography long years ago. Regardless, if I did, would I really want to flash my equipment in the face of an already grumpy 3,000 pound bull moose? After which he might decide to pound me into Marilyn jelly? I can’t even run any more, so he’d have a high old time taking care of me. I might not even get a chance to explain how I’m a blogger and my followers want moose pictures. He might prefer not to listen. Moose can be quite unreasonable. So tomorrow is a big day. It’s a five-hour drive if there is no traffic. We are taking the coastal road — Route 95 to Maine — than inland via Route 201. With pit stops for nature, lunch, and groceries. It will be a long day. We should get started on errand running now, but instead, here I am, writing and there’s Garry, on his computer doing exactly the same thing. With the dogs between us. Snoring. But it’ll be fine. Just FINE I tell you! Maybe even finer than fine. Author Marilyn ArmstrongPosted on 10/04/2014 10/04/2014 Categories Animals, DPChallenge, Nature, New England, Transportation, Travel, Vacation, WeatherTags big day ahead, Daily prompt, DPchallenge, Maine, moose, phototography, travel, vacation36 Comments on READY – ON YOUR MARK – GET SET … VACATION!